I have received confirmation on giant bones from Ecuador! Klaus Dona is an artefact researcher from Austria. During his work he discovered that there were quite a lot of archaeological findings that were hard to explain. He came across some bones from Ecuador, and examinations by experts confirmed that they belonged to a 7.6 meter human giant! It was a Canadian reader of these webpages that passed on a link to a slide show on Youtube that he had come across. It turned out to be a video of a 45 minutes slideshow by Klaus Dona, an artefact researcher from Austria, called "The Hidden History of the Human Race". - It's data-rich, detailed, intensive, absorbing, and may contain more startling information about the history of the human race in one place than any other video you've ever seen, writes Bill Ryan of Project Avalon who made the interview. It was very interesting indeed. Klaus Dona was also mentioning giants at the end of the slideshow - and what caught my attention was the story of Father Carlos Vaca, who was working as a priest in hospitals in Ecuador, South America. In 1964 a part of a mountain in the province Loja broke down and he was called to see the bones people had found - the broken bones of a giant. There were some pictures at the same time as Dona's narrative but they showed skeletons of legendary giants, not broken bones. So I clicked on a link to Klaus Dona's own webpages "Unexplained Mysteries" and there I could see the picture of the bone fragments and read more about the priest and what he had found. I am trying to show that human giants have lived on earth, and I thought that this might be another proof - if I just could get Klaus Dona to confirm the story and the picture. So I send an email to the Austrian researcher, and he was kind enough to reply! 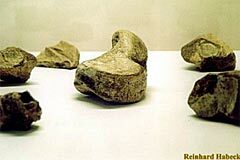 - I confirm that the photo Reinhard Habeck took of some giants bones is real, writes Dona. It turned out that Father Vaca had taken care of some of the bones and they were found at his estate after he passed away. Klaus Dona was able to take some of the bones with him to Austria for his exhibition "Unsolved Mysteries", and he had several experts checking them. One of the pieces was identified as a human heel-bone and one as a human bone that can be found under the skull. - All these bones belonged to a 7.6 meter human giant, explained Dona. They have not yet made any age dating but tried to get a DNA analysis. It turned out impossible to get a DNA-sample form the bones and the archaeological DNA-expert thought they might be too old. There you are. Klaus Dona have managed to take picture of and examine bones from Ecuador said to be of a giant human - and experts have confirmed that they in fact are human bones. And would belong to a person 7.6 meters tall! "Unsolved Mysteries" and we had several experts checking these bones. the bones. They might be too old, concerning the archaeological DNA-expert.